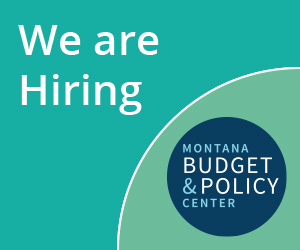 The Montana Budget and Policy strives to serve as a resource to members of the media by providing timely and accurate data, research, and policy analysis. To learn more about any of our research or to get a quote, please contact Tara Jensen, Co-Director of Public Affairs at 406-422-5848. To read news stories and editorials featuring the Montana Budget and Policy Center, click here. To read our news releases or press statements, click here. To access a full list of our reports and other resources, click here.